It's a nice use-case: timely event promotion to existing and potential ticket buyers. The risk is that the model might have fallen apart because some of the scans might have been necessary for linking the others. Think of the model as a "House of Cards" – careful about removing a 'weight-bearing' Scan. I tend to capture and prune the scans I feel are not necessary for storytelling, but are needed to help initially connect the Scans. In this example, I wanted to deliver one backstage tour model: not two. For context, Matterport writes: "The purpose of the live alignment [on the iPad Air] is to check to make sure the Scans can align before the server [Cloud] attempts to create a model from them. So, yes, deleting scans from the edges will maintain the alignment of the ones remaining." While it took about 16 hours to process, it worked as one model. My fall-back (which I also did) was to duplicate the original model twice: Model 1: front of the house and backstage except the "backyard"; Model 2: just the "backyard". I managed our clients expectations upfront that I might need to deliver the backstage tour as two models. If you're counting, there were four models: 1) 300+ scans; 2) removed 100+ scans; 3) front of the house and the backstage except the "backyard"; 4) the "backyard". I only delivered #2 to our client (he is thrilled). Got an example of your best work? Add it to this thread. Great job Dan but I've discovered a bug, it seems that for some reason floorplan keeps coming up as you move through tour. It seems to happen as your click center right without warning. You're just clicking away through the tour and boom you just jump into the floorplan. I would be interested if anyone else has experiences this problem. Anyway this is a great job of covering a massive location with a seamless tour. That sound great, I look forward to see that one. Please keep pushing the limits of the camera to show us all what it is capable of. I'm using Chrome Version 39.0.2171.71m on a PC running Win 7 64 bit. I did some more checking and the problem only appears when I run the Showcase in the small window you have provide above. When I run your full Showcase in my.matterport there are no issues with it jumping to the floorplan. I did find one link though that did't link for some reason it was the link that lead to the dressing room down the stairs backstage. It didn't seem to do anything. Great job and tour. I can see why this too you so long to capture and for Matterport to stitch this all together. 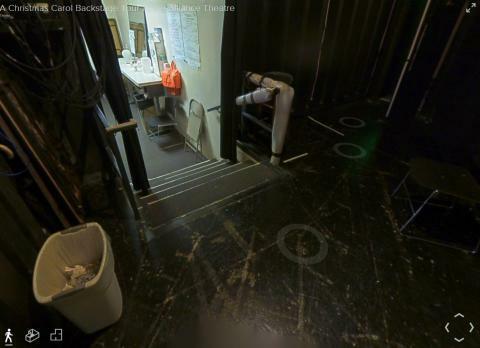 @GarySnyder Can you post a screen grab with the "dressing room down the stairs backstage"? I do not recall shooting down stairs: just at the top looking down. You can get to this Scan (at the top of the steps) from the Floor Plan View, but you can not 'walk' to get. That's a first. Looks like I removed a key Scan that goes to the stage. (I did not capture down the stairs, so, not a critical scan). Full-day 3D Showcase photo shoot today (Monday), so I may be slow to reply, if you post here again. Interesting thing we learn about the capture app as we push its boundaries. If I find any little peculiarities about the app I'll be sure to let you know. First of all, kudos for pushing the boundaries. I was using an iPad air with 64g. I had to delete and do a memory wipe to get this to load. I am not sure how others will fare depending on devices. With that said, scans this big could turn away many people just trying out the technology for the first time. I could see this being a great tool to provide theater goers a chance to see what vantage point their seat may have or providing them the view from the performer on stage. When I read the caption, I envisioned people moving around the set during a rehearsal or something. It got my attention, but you could have left out a few rooms that really had nothing in them but construction equipment, as it didn't provide me any tie in to the play. It seemed to be just too much stimulus that took away from the message you were trying to send. I hope that I am not coming off as too critical, just constructive. @ccctucker Thank you for the feedback. Always welcomed and appreciated. Yes. It's a challenge / trade-off regarding size of the model (200 scans versus 100 scans). Yes. Our client's preference was one model (including the construction equipment). In future projects, imagine an actress leading the backstage tour. I routinely capture with 209+ scans, though Matterport only supports up to 200 scans. Each has different scan needs. 1. I never delete scans while capturing.